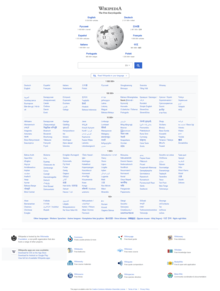 www.wikipedia.org, the index of Wikipedia, a multilingual online encyclopedia. Here the page offers many different languages. When an HTTP client (generally a web browser) requests a URL that points to a directory structure instead of an actual web page within the directory, the web server will generally serve a default page, which is often referred to as a main or "index" page. A common filename for such a page is index.html, but most modern HTTP servers offer a configurable list of filenames that the server can use as an index. If a server is configured to support server-side scripting, the list will usually include entries allowing dynamic content to be used as the index page (e.g. index.php, index.shtml, index.jsp, default.asp) even though it may be more appropriate to still specify the HTML output (index.html.php or index.html.aspx), as this should not be taken for granted. An example is the popular open source web server Apache, where the list of filenames is controlled by the DirectoryIndex directive in the main server configuration file or in the configuration file for that directory. It is possible to make do without file extensions at all, and be neutral to content delivery methods, and set the server to automatically pick the best file through content negotiation. If the server is unable to find a file with any of the names listed in its configuration, it may either return an error (generally 404 Not Found) or generate its own index page listing the files in the directory. It may also return a 403 Index Listing Forbidden. Usually this option is also configurable. Since the index page is often the first page of a Web site that a user sees, it is sometimes used to offer a menu of language options for large Web sites that use geo targeting. It is also possible to avoid this step, for example by using content negotiation. ^ "mod_dir - Apache HTTP Server". httpd.apache.org. Retrieved 2014-05-30.